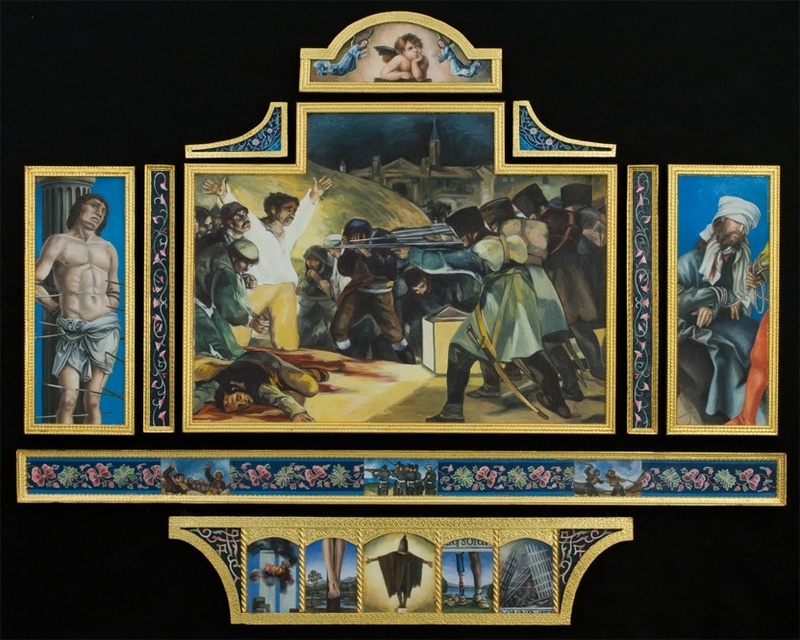 Pictured below is "Chronicles of War, Saints and Martyrs," 2007, by Phyllis Plattner, oil and gold leaf on linen on panel. It is one of 23 works which comprise "Gods of War!" at the Katzen Center at American University until March 15. My review of her show which will also be featured on DC Art News.Blogspot.com, follows. In 1770 Edmund Burke said, "The only thing necessary for the triumph of evil is for good men to do nothing." These words are as relevant today as they were then. There are, in the history of the visual arts, many examples of artists "doing something", speaking in images rather than words. In 1830 Eugene Delacroix painted "Liberty Leading the People." He renders "Liberty" in female form leading the people over the dead bodies of the old order, in one hand holding aloft the tricolor flag of the French Revolution, the epic gruesome battle for freedom; in the other hand she carries a bayonetted musket. This iconic painting of the July 1830 Revolution depicts the overthrow of King Charles X of France. Delacroix wrote his brother: "If I haven't fought for my country at least I'll paint for her." In 1814 Francisco Goya painted "The Shootings of the Third of May 1808 in Madrid." It is a gut-wrenching portrayal of a man with arms upraised before a firing squad. He has an expression of horror on his face. His comrades lie in a bloody heap at his feet. Goya's emotionally charged depiction of this man's last minutes of life was unprecedented. The painting graphically illustrates the Spanish resistance to Napolean's invasion and occupation in the Peninsular War. Art historian Kenneth Clark has said this is "the first great picture that can be called revolutionary in every sense of the word, in style, in subject, and in intention." In 2007 Phyllis Plattner began the creation of a series of artworks in which she made meticulously rendered copies of art historical paintings in the style of the original artist, and photographs culled from newspapers and magazines. In "Chronicles of War, Saints and Martyrs" (2007), she utilized Goya's historic painting, mentioned above, and amplified its effect. She placed Goya's painting in the center of a seventeen-paneled piece. To the left of Goya's work is the arrow-pierced Saint Sebastian, an early Christian martyr (288 AD) from "The Martyrdom of Saint Sebastian" by Andrea Mantegna, (1480). On the right is Christ, blindfolded and bound, about to be scourged, painted by Van der Weyden, (1450). Further heightening the effect of "Chronicles of War, Saints and Martyrs" is a horizontal row of images along the bottom, a format known as predella panels. From left to right are painted the following: The Twin Towers ablaze on September 11, Christ's feet nailed to the cross, the well known image of an inmate in Abu Ghraib, a survivor of World War II with two prosthetic legs, and finally the tangled heap of stainless steel, a ghostlike cathedral, the remains of the World Trade Center. A cherub from Raphael's Sistene Madonna glances heavenward atop all of this with additional angels astride. And there's more, even in this one piece. This is one of twelve complex pieces that make up "Chronicles of War", the epic two-part show at the Katzen Center at American University. The other half is entitled "Legends." The two together form "Gods of War!" "Legends" details the Zapaista uprising in San Christobal, Chiapas, Mexico, which Plattner witnessed. She and her archeologist husband later lived in Italy. She tells the story of the Zapatista uprising and utilizes Italian Renaissance paintings, substituting Zapatistas for the saints and apostles. For example, "Legends, Deposition" is after a painting by Caravaggio (1585), and "Legends, Mary Magdalene in Glory," is after a painting by Domenichino (1600). The succession of places in which she lived is reflected in the subject matter, style, and technique. Italian Renaissance meets Liberation Theology. The soft-spoken, long time professor at The Maryland Institute College of Art is profoundly anti-war. In order to speak against war and violence she employs images of violence. Though the images are horrific the overall effect is beautiful. "Chronicles of War" is a pastiche of images of human violence across cultures and across time. She juxtaposes violent images with the bucolic and the divine, skies at sunrise and at sunset, cherubs and puttis and angels, Jesus and Mary. Eight or more panels are assembled into one artwork. She also adds borders of gorgeous motifs from a multitude of cultures and intricately carved and gold-leafed frames and borders. The overall shape of each work are based on Renaissance altarpieces, copied directly from the Italian in the "Legends" half of the show, and more loosely based on Asian, German and Italian altarpieces in "Chronicles of War." Plattner has done all of this work herself. It is a fourteen year project, to which she plans yet to add. It represents an immense labor of love. Plattner enumerates the vast array of violence throughout human history. From the guillotine to napalm, to a pyramid of human skulls, from child soldiers to suicide bombers, from Napolean to the Samari, from Guernica to the Mayan Bonampak murals in Chiapas, Mexico. Could there possibly be something she has left out? Plattners work has a continuing relevance to our present condition as the world is menaced by ISIS. One might say that the destructive history of all humankind is represented here. The forms of destruction are assembled by type of destruction so that each artwork has a theme. In "Chronicles of War, Head and Hands," 2008, the subject is beheadings. In "Chronicles of War, Swords and Lances," 2008, a pastiche of death by blade, the central image is the "Battle of San Romano" by Paolo Uccello (1432). Above fourteen panels of death and destruction, cherubs alight in the vault of heaven. With fist-fulls of flowers they rain rose petals over the bloody folly of humankind. The last day of this show is March 15. I regret not having gotten this review out sooner. I do hope you have a chance to see it. Please feel free to reply directly to this email with your thoughts. If you'd like to have a look at my work you can do so by clicking www.amymarx.com.